D Dallas Ehrhardt (Brandon, Moose Jaw, Prince George, 2009-13) has signed a one-year extension with the Manchester Storm (England, UK Elite). This season, he had a goal and eight assists in 51 games. 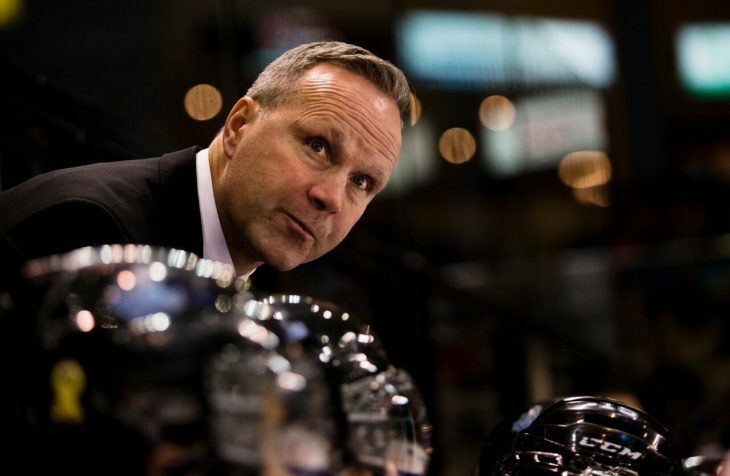 After five seasons as the head coach of the WHL’s Victoria Royals, Dave Lowry is moving on. Dave Lowry is leaving Victoria for Los Angeles. club as an assistant coach where he will work alongside head coach John Stevens. Stevens is preparing for his first season as the Kings’ head coach, having replaced Darryl Sutter. Lowry is the Royals’ all-time winningest head coach, with a record of 199-112-22. He is a two-time winner of the WHL’s Dunc McCallum Memorial Trophy as the coach of the year (2013-14, 2015-16). He also worked with the Calgary Hitmen, as assistant coach, associate coach and head coach. In his only season as head coach, Lowry guided the Hitmen to the WHL final. Lowry also has twice been on the coaching staff of Canada’s national junior team, as an assistant in 2015, when the team won gold, and as the head coach in 2016. The Royals are the third WHL team now in the market for a head coach, joining the Calgary Hitmen and Spokane Chiefs. Jason Becker — A former WHL player who was an assistant coach with the Prince George Cougars, Becker, 43, spent this season as an assistant with the BCHL’s Penticton Vees. Trent Cassan — Cassan, 33, won back-to-back SJHL championships with the Yorkton Terriers in a run of six-plus seasons. He left Yorkton prior to this season to join the Calgary Hitmen as an assistant coach. Dean Chynoweth — The 48-year-old Chynoweth didn’t coach this season after being fired by the NHL’s Colorado Avalanche after serving as the head coach of their AHL affiliate for four seasons. A former WHL player, he spent nine seasons as a WHL head coach — four with the Seattle Thunderbirds and five with the Swift Current Broncos. Kevin Constantine — His contract wasn’t renewed by the Everett Silvertips when their season ended. Constantine, 58, won at least 38 games in each of the past four seasons in Everett. His extensive coaching career includes NHL experience. Kyle Gustafson — He has been with the Portland Winterhawks for 13 seasons, the last two as associate coach. In recent seasons, Gustafson, 36, has filled the role created when Travis Green left for the AHL’s Utica Comets. Green now is the head coach of the NHL’s Vancouver Canucks. Dan Lambert — He’s a free agent, having been fired last week by the NHL’s Buffalo Sabres as the head coach of their AHL affiliate, the Rochester Americans. A former high-scoring WHL defenceman, Lambert, 47, left for Buffalo after six seasons with the Kelowna Rockets, the last one (2014-15) as head coach. The Rockets won the WHL title in his one season as head coach. Mitch Love — The fans in Everett love the Silvertips’ assistant coach who has been there for six seasons, the last four learning alongside Constantine. Love, 32, is a former WHL defenceman who knew his way around the penalty boxes. Don Nachbaur — The third-winningest head coach in WHL history, Nachbaur, 58, and the Spokane Chiefs parted company when their season ended, despite his having a year left on his contract. In the WHL, he also has been head coach of the Seattle Thunderbirds and Tri-City Americans. Enio Sacilotto — A career coach, he has an extensive resume that includes experience in junior A, Europe and the WHL, the latter with the Chilliwack Bruins/Victoria Royals. After six seasons as an assistant coach with the Bruins/Royals, Sacilotto, 58, spent this season as Victoria’s director of player development. He also was the head coach of the Croatian team at the 2017 IIHF World Championship (Division 1, Group B). Dave Struch — The former head coach of the Saskatoon Blades is on the list, although he’s not likely to leave his position as assistant GM/assistant coach with the Regina Pats. Struch, 46, is a good fit with John Paddock, the Pats’ GM/head coach, and the Pats will be the host team for the 2018 Memorial Cup. Jay Varady — The head coach of the USHL’s Sioux City Musketeers isn’t a stranger to the WHL. He spent seven seasons on the staff of the Everett Silvertips. Varady 39, got the Musketeers into the USHL final this season and was named the league’s coach of the year. The Portland Winterhawks made last week’s signing story official on Tuesday when they introduced F Kieffer Bellows to fans and media. From Edina, Minn., Bellows was a seventh-round pick by the Winterhawks in the WHL’s 2013 bantam draft. 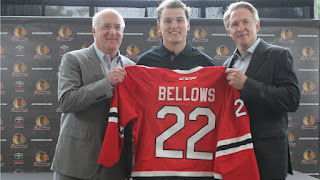 Bellows brings a history of winning to the Winterhawks, having won a Minnesota state title with Edina High School, a USHL championship with the Sioux Falls Stampede, and a gold medal with Team USA in the 2017 World Junior Championship. Bellows had seven goals and seven assists in 34 games as a freshman at BU. He had two goals and an assist and was a force in seven games with the U.S. national junior team. Prior to this season, Bellows scored at every stop. In 2014-15, with the Stampede, he had 33 goals and 19 assists in 58 games. Last season, he had 50 goals and 31 assists in 61 games with the U.S.’s U-18 team, and also had 16 goals and 16 assists in 23 games with the U.S.’s U-20 side. His father, Brian, is a former NHLer who won a Memorial Cup with the OHL’s Kitchener Rangers in 1982 and a Stanley Cup with the Montreal Canadiens in 1993. Paul Danzer of the Portland Tribune has more right here. The Regina Pats have signed forwards Mackenzie Belinski and George King to WHL contracts. . . . Belinski, 17, was a fifth-round selection in the 2015 bantam draft. This season, he had 21 goals and 33 assists in 44 games with the midget AAA Yellowhead Chiefs. From Vista, Man., he was a second-team all-star in the Manitoba Midget Hockey League. . . . King, 18, is a list player from Calgary. This season, he had 36 goals and 18 assists in 55 games with the MJHL’s OCN Blizzard. The Vancouver Giants have signed F Krz Plummer to a WHL contract. He was a third-round selection in the 2017 bantam draft. Plummer, from Whitecourt, Alta., had eight goals and 13 assists in 27 games with the Pursuit of Excellence’s bantam prep team this season. The 6-foot-0, 200-pound Plummer added two goals and four assists in five playoff games as PoE won the bantam prep title. The National, CBC-TV’s primary newscast, carried a piece Monday night about the class-action lawsuit facing the CHL and the three leagues under its umbrella. It included interviews with Lukas Walter, who discussed his time with the WHL’s Tri-City Americans, and Spencer Abraham, who played with the OHL’s Brampton Battalion and Erie Otters. Walter is part of the lawsuit; Abraham is opposed to it. . . . The National piece, which is 11 minutes 45 seconds in length, is right here. Terry Bangen is leaving his role as an assistant coach with the WHL’s Kamloops Blazers to become an assistant coach with the ECHL’;s Worcester Railers. . . . Bangen, 66, will work alongside Jamie Russell, the Raiders’ general manager and head coach, who is from Kamloops. . . . The Railers, an expansion franchise, will begin play in 2017-18. . . . Bangen has been with the Blazers for the past three seasons. His resume also includes two seasons (1996-98) as an assistant with the Vancouver Canucks. Earlier, he was on the Blazers’ staff for five seasons (1990-95), during which time they won three Memorial Cup titles. . . . Bangen also spent 10 years with the Tri-City Americans as director of player personnel and later senior advisor to hockey operations. Scott Gomez, who played for two seasons (1997-99) with the WHL’s Tri-City Americans, has joined the NHL’s New York Islanders as an assistant coach. Gomez played 16 seasons in the NHL, winning the Calder Trophy in 1999-2000 and capturing two Stanley Cups, both with the New Jersey Devils (2000, 2003). . . . With the Islanders, he will work alongside head coach Doug Weight. . . . The Islanders also are expected to add Kelly Buchberger, who played two seasons (1984-86) with the Moose Jaw Warriors, to their coach staff at some point in June.